Dang Darbar to be held on 13th March 14 upto 15th March 14 honours a tradition that began in British times when the rulers and other leaders of villages got together for gathering called “Darbar”. 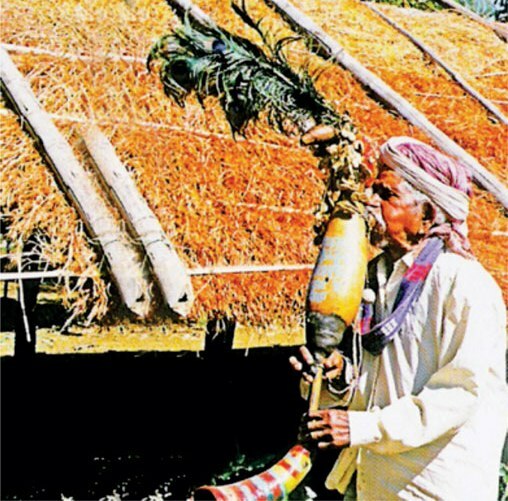 The tradition continues today in the Dangs, a tribal dominated district in South Gujarat in India as many of the former Rajas and Naiks are still accorded status unlike the princely families whose titles and privy purses were abolished. Dang Darbar is such only annual event where this cultural heritage is preserved. Kings of village Gadhvi, Daher, Linga, Vasurna and Pimpri along with 9 Naiks and 476 Bhavbands are awarded Political Pension till date. This is a time for great festivity for 3 days at Ahwa, the district headquarter of Dangs. The exact venue of this festival is Ahwa near Saputara, but the festival has drawn its name from the Ahwa Darbar, a one–time venue assembly (Darbar) venue for English ministers and mandarins during the Raj era. Now, the name has been changed to Jamabandi Durbar and the District Collector officiates at it. For travellers, it is a rare opportunity to see tribal communities like Bhils, Kunbis, Warlis, Gamits and Konkanis in their traditional attires. 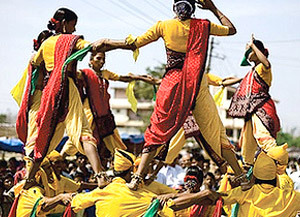 Showcasing culture and tradition is the Rally of 5 Kings with Naiks, the Bhavai and the Dangi Dance – spectacular to watch as the people move in concentric circles to the beat of percussion and wind instruments. Many of these musical instruments are typical of South Gujarat. The sight transforms to bright and gung ho from dry and serene. A galore of men and women attired in riots of colour are seen agog with festivities during the Darbar. Nomad tribes carry a shehnai (wood-wind instrument) and other musical instruments with them. Dang Darbar is normally held in March-April each year just a few days before Holi. Tribal dances of the region are spectacular to watch. People move in concentric circles holding each other by the waist, dancing to the beat of percussion and wind instruments. Many musical instruments are typical of this district. All men wear lion clothes with a waistcoat and coloured turban. Women wear sarees and blouses with heavy silver jewellery. The carnival ground can be seen abuzz with activities and merchants who come to sell their products. 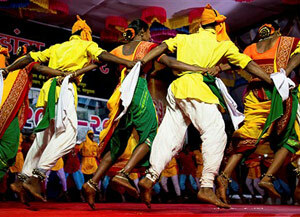 Dang Darbar, a three day festival, witnesses many activities like folk dances, Raas, Garba programs, songs and dramas. It also provides a platform to search for brides and grooms. Located high in the Saputara Hills, adjoining the borders of Maharashtra State, Dangs is the home of adivasis who have lived in the forests and highlands of the Dangs region from time immemorial. The most important town is Ahwa, 2000 feet above sea level. Higher still is village of Don, which is 3560 feet above sea level. 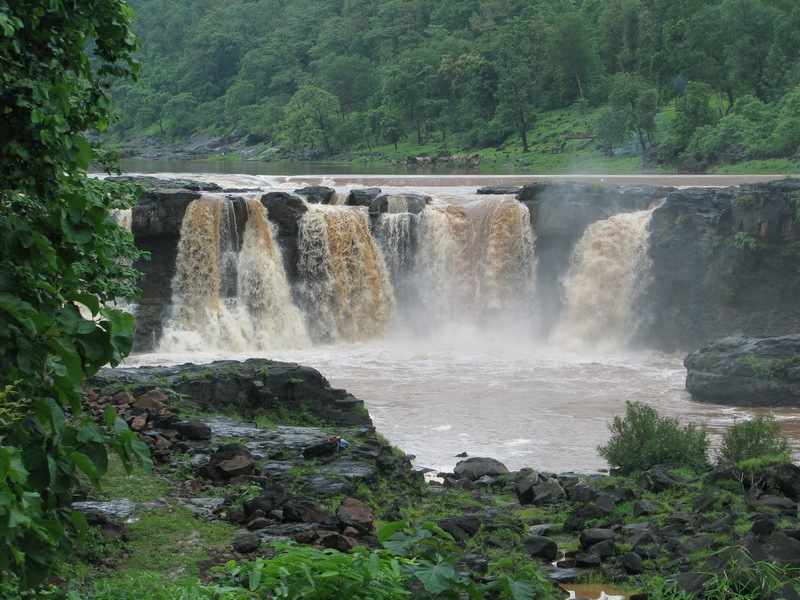 Nearby is Saputara which may be called Gujarat’s hill station. The climate here is cool and pleasant. The resident adivasis derive their livelihood from the forests which are rich in timber, honey, wax and lac. Many wild animals live in the forests including tigers, chital, bears, pigs , and deer. There are numerous snakes in the district, including cobras and pythons. Within easy reach of Ahwa by road are Surat (155 kms) a busy industrial city with historic associations ; the part of Daman (149 kms ) once a Portuguese colony ; Sanjan, where the Parsis first landed in Indian, and many well-known of Gujarat. The city of Mumbai can be reached from here with in few hours. Next page Next post: “Welcome” Brussels throws its doors open!